The Model 610 is a six-shot, double-action revolver chambered for the 10mm Auto cartridge. 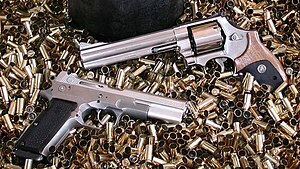 The 610 was manufactured by Smith & Wesson on the N-frame, similar to the Smith & Wesson Model 29 in .44 Magnum, and the Model 27/28 in .357 Magnum. The 10mm Auto is a rimless automatic pistol cartridge so moon clips are used to hold cartridges when loading and extracting spent cases en bloc. Since the .40 Smith & Wesson is a shorter, less powerful variant of the 10mm Auto but has the same diameter, the Model 610 can chamber and fire .40 Smith & Wesson rounds. The Model 610 debuted in 1990, but shortly after its introduction, popularity of the 10mm round was declining and slow sales caused Smith & Wesson to retire the model in 1992. After a 6-year hiatus it was reintroduced in 1998 for competitive shooting matches with a few changes. The firing pin was moved from the hammer to inside the frame and an internal safety lock was added. This reintroduction was at the behest of members of the International Practical Shooting Confederation but the Model 610 is more commonly used in International Defensive Pistol Association matches. In 2019 Smith and Wesson reintroduced the 610 in four- and six-inch barrel lengths. Like the 1998 version, the 2019 models have a six-round capacity, stainless steel for all major parts, and Smith and Wesson's safety-lock system. The 2019 version comes standard with black synthetic finger groove grips, a black blade interchangeable front sight, and an adjustable white outline rear sight. The 610 is capable of firing both 10mm and .40 S&W cartridges using moon clips that come standard with the revolver. ^ Supica, Jim; Nahas, Richard (2007). Standard Catalog of Smith & Wesson. Iola, Wisconsin: F+W Media, Inc. p. 250. ISBN 0-89689-293-X. ^ a b c d Sweeney, Patrick (2004). "The 610: The revolver for a pistol round". The Gun Digest Book of Smith & Wesson (Iola, Wisconsin ed.). Gun Digest Books. pp. 118–125. ISBN 0-87349-792-9. This page was last edited on 28 March 2019, at 00:10 (UTC).